The Malaysian Bar is concerned that section 107(b) of the Administration of Islamic Law (Federal Territories) Bill 2013 (D.R.1/2013) (“the 2013 Bill”), which has been tabled in Parliament, purports to provide that the consent of one parent alone is sufficient for the conversion of minor children to Islam. We reiterate that the unilateral conversion of minor children to any religion by a parent, without the consent of the non-converting parent, is contrary to our constitutional scheme. The 2013 Bill should reflect the meaning of “parent” contained in Article 12(4) of the Federal Constitution, read with Article 160 and the Eleventh Schedule of the Federal Constitution, which expressly provide that all words appearing in the Federal Constitution which are stated in one gender also include the other gender, and all words in the singular also include the plural. Article 12(4) of the Federal Constitution provides: “For the purposes of Clause (3), the religion of a person under the age of eighteen years shall be decided by his parent or guardian.” (emphasis added). The same gender reference to “his” appears in Article 12(3). IPOH: The Government should remove the "absolute power" of the Attorney-General (A-G) to decide on who should be prosecuted. Transparency International (Malaysia) founder Tunku Abdul Aziz Ibrahim said the decision to pursue cases in court should be left in the hands of a director of public prosecution and his advisory board of legal officers. "This is so that a case can be thoroughly discussed among the members instead of it being left to one person to say 'insufficient evidence' which has been the situation today. KUALA LUMPUR 7 Feb. Teka-teki mengenai tarikh pilihan raya umum ke-12 terus hangat diperkatakan dengan spekulasi terbaru membayangkan ia akan diadakan seawal 8 Mac atau selewat-lewatnya 15 Mac ini. The Commission of Inquiry into the ＆Lingam＊ video clip could be the best opportunity Malaysia has to restore public confidence in its judiciary and how justice is dispensed, writes Lee Siew Lian . SINCE September, the catch-phrase on Malaysians' lips has been "Correct, correct, correct", complete with Indian inflection. KUALA LUMPUR - A CONFUSING apex court verdict that Malaysia's Muslim converts can seek divorce in the civil as well as syariah courts has resurrected non-Muslims' fears about their waning rights. PARTI Gerakan Rakyat Malaysia produced 24,000 copies of a 40-page booklet highlighting key points of the Federal Constitution, Rukun Negara, Vision 2020 and the National Mission this year. It was handed out to members at the party's national delegates conference in October. The booklet is still being distributed to the public at party functions. 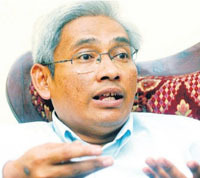 KUALA LUMPUR (Dec 5, 2007): The government should manage demonstrations properly and not use force, as this will not help to solve the real problems at hand, said Datuk Zaid Ibrahim. KUALA LUMPUR - LAWYER P. Uthayakumar, who recently roused thousands of Indians to take to the streets in a protest against their plight, is a man who stirs up a lot of mixed feelings. Hello On Two: "Is There a Need for Judiciary Reform?" KUALA LUMPUR, FRI: THE Yang di-Pertuan Agong Tuanku Mizan Zainal Abidin has expressed regret over claims that he and the Palace approved and suppported Saturday＊s illegal rally in the city. In a statement issued here today by the Datuk Pengelola Bijaya Diraja of Istana Negara, Datuk Wan Mohd Safiain Wan Hasan, the King also regretted the gathering, which was organised by the Coalition for Clean and Fair Elections (Bersih) and supported by the opposition parties. 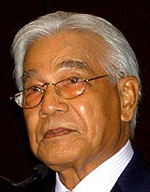 PETALING JAYA: Perak's Sultan Azlan Shah, a former distinguished highest-ranking judge, is believed to have played a crucial role in the matter of filling the vacancy of Chief Justice of the Federal Court. This year marks the 50th year of our nation＊s Independence. It is also the 50th year of our Merdeka Constitution. You must have Real Player installed before you are able to listen. Click here to download a free Real Player. KUALA LUMPUR - MALAYSIA'S top judge is due to retire in less than a week, but a controversy is brewing as the government has yet to announce either the extension of his tenure or his successor. PUTRAJAYA: Doctors have a duty to disclose the risk to their patients before performing critical operations. And it is for patients to decide whether to go for surgery. AN INTERESTING ARTICLE ON THE DILEMMA FACING THE MALAYSIAN CHINESE IN PRESENT POLITICAL SCENARIO. MUST READ FOR UNDERSTANDING TO KNOW WHERE YOU STAND IN FUTURE. A fair and objective analysis. I REFER to the report Time to Malaysianise common law system by Dr Wan Azhar Wan Ahmad (The Star, Sept 18). Like all others who advocate the replacement of the English common law, Dr Wan Azhar has laboured under a serious misconception that we have to establish and develop the Malaysian common law when, in fact, the Malaysian common law has been actively evolving and developing since Merdeka. It is actually a non-issue.? The Judiciary has been under the spotlight lately for various issues including the still-unfilled post of Chief Judge of Malaya. There is a need to handle this matter wisely to avert the possibility of another constitutional crisis. 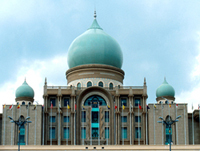 PETALING JAYA (Sept 14, 2007): In a landmark decision, the Federal Court today allowed an application by a lawyer to review its earlier judgment. PETALING JAYA (Sept 3, 2007): The monarchy has a role to play as the guardian of good governance and the democratic process as mandated by the Federal Constitution, the Raja Muda of Perak said. "It is an often overlooked or under-appreciated fact that the monarchy in Malaysia is supposed to play a productive role by being a healthy check and balance in the system of governance," Raja Dr Nazrin Shah said. One year ago I had planned to celebrate our 50th Merdeka anniversary by doing two things. The first is to pen a celebratory verse and the other is to fly the Malaysian flag in my house for one whole year till 31 August this year. Law firms riding all-time high - but is the boom about to end? TAIPING, Aug 18 (Bernama) -- Sultan Azlan Shah of Perak says the nation can lose its independence if the people's spirit to serve the country fades away. He also says, without noble leadership principles, the spirit to serve the nation will become thin and when it happens, the country's independence will crumble. History shows that the collapse of big empires was due to their leaderships losing their genuine spirit to serve the nation," he said when launching Sekolah Menengah Sains Raja Tun Azlan Shah's 25th anniversary celebration here today. Therefore, he urged for attention be given to the students' personality development besides academic achievement to produce quality human capital. He said producing high academic achievers gives no meaning for the country and nation if they are untrustworthy, irresponsible, dishonest and unfair. A situation like this will lead to tyranny and injustice out of greed, he added. Present at the function were the Raja Permaisuri of Perak Tuanku Bainun, Perak Menteri Besar Besar Datuk Seri Tajol Rosli Ghazali and Education Ministry Secretary-General Tan Sri Dr Zulkurnain Awang. R. Deno Cole was on vacation in Malaysia. On July 5th, 2007 R. Reno Cole make an unofficial visit to Perak Bar. He paid a courtesy call on our firm and Messrs Chan & Associates. 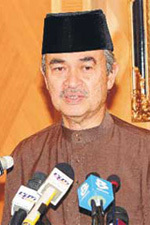 He also visited a few landmarks of Ipoh. He visited the High Court, the Subordinate Courts and observed proceedings in the Subordinate Courts. McGEHEE, STEWART, COLE, DUPREE & ROPER, P.A.